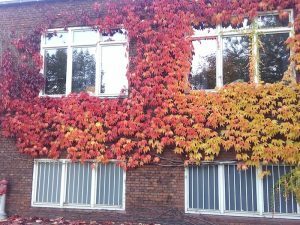 ClorofilleBlogblogWhy do leaves change colour in autumn? Every year I am amazed with the colours of the leaves in this period and this year I am not the only one in the family coming back home with yellow, red and orange leaves in every pocket: my son can actually collect even more leaves then I do! But why leaves change colours? 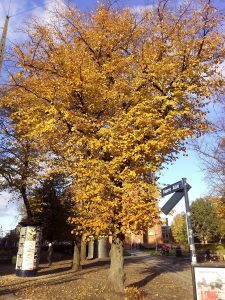 Some trees are deciduous, their leaves fall for a certain period of the year and new leaves reappear after 2 weeks or few months. 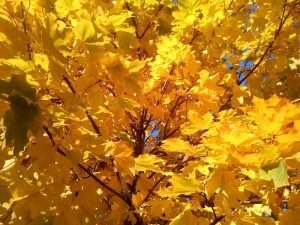 The fall of leaves is actually an adaptive trait that has its origins in the late Cretaceous, it was a response to drought periods. The first flora that evolved this trait was from warm or tropical regions. Thanks to this adaptation, trees were able to colonize new habitats at higher latitudes with cooler temperatures and winter droughts. While it is a good strategy to loose leaves during winter, it would not be good to waste all the leaves content. Leaves have high nitrogen content because of chlorophyll, the green pigment that is used in the photosynthesis process. In autumn, chlorophyll breaks down to be retranslocated in the trunk and branches. In this process other pigments, such as carotenoids (orange) or anthocyanins (red), are unmasked and leaves change colours. red and yellow leaves have an anti herbivore function, because they look like they are dead or poisonous, herbivorous would not eat them. Also herbivorous insects, normally green, can not camouflage on a red leave and are a easier pray to their predators. Enjoy the last few days of red and yellow leaves!